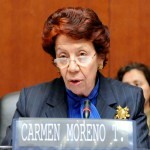 Carmen Moreno was part of the Mexican delegation to the World Conference on Women (1975, Mexico) and served as a delegate to the Economic and Social Council (ECOSOC) of the United Nations to establish the Decade for Women: Equality, Development and Peace (1985-1995). During her international diplomatic career, Carmen Moreno was the Ambassador of Mexico to Costa Rica and Guatemala, as well as Permanent Representative of Mexico to the OAS and Under Secretary for Foreign Affairs in charge of the United Nations (UN), Africa and Middle East. She represented Mexico at numerous meetings and conferences on economic and political issues. She was Director General of Multilateral Economic Relations and American Regional Organizations. Among her most significant achievements is that of the adoption by consensus of a United Nations General Assembly resolution on debt and development, during which she acted as Coordinator of the G77. As Chair of the Working Group, she was also instrumental to the drafting and negotiation adoption of the Inter-American Convention against the Illicit Manufacturing of and Trafficking in Firearms, Ammunition, Explosives and other related materials (CIFTA). She completed her career at the Ministry of Foreign Affairs in Mexico by coordinating the Programme for Conflict Prevention and Negotiation at the Centre for Interdisciplinary Research in Social Sciences and Humanities at the National Autonomous University of Mexico (UNAM). In December 2003, she was appointed Director of the UN International Research and Training Institute for the Advancement of Women (UN-INSTRAW, now part of UN Women) by then Secretary General, Kofi Annan. In July 2009, the Secretary General of the OAS, José Miguel Insulza, appointed her Executive Secretary of the Inter-American Commission of Women (CIM), which is her current post. She is Citizen Counselor of the National Commission of Human Rights in Mexico- a position she gained through a unanimous vote by the Mexican Senate. She has taught courses and lectured at various universities in Mexico and abroad. She was Treasurer and President of the Mexican Foreign Service Association and founder of the Center for Strategic Analysis and International Negotiation (CAENI). In 1994, the President of Mexico granted her the rank of Eminent Ambassador; the first woman to earn such an honor. She was awarded a medal honouring her 25 years with the Mexican Foreign Service, as well as the Silver Cross Order of Juan Mora Fernández (1994). The, President of Guatemala, Alfonso Portillo awarded her the Grand Cross Order of the Quetzal (2003) and President François Hollande of France awarded her the Order of the Legion of Honor in the rank of Dame for her work for women’s rights (2013).